Casio has announced a new arrival to its EXILM range, the EX-Z150. This super-slim compact camera is reputed to be the world's slimmest (at just 20.1 mm thick) but still manages to pack a lot of goodness into its slender chassis. For starters, the standout feature is the EX-Z150's LCD screen. At 3in this would be a large screen even for a DSLR, but on a compact it's positively gargantuan. 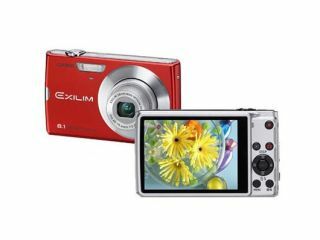 It's not surprising that this is the biggest screen Casio has added to its EXILM range. Add to this 8.1MP resolution and you have a shooter that's capable of big things. Lens-wise, the EX-Z150 contains a built-in wide-angle 28 mm (35 mm film equivalent), which is capable of 4x optical zoom. Memory comes in the form of a full-size SDHC memory card. Those who forget extra memory will be pleased to hear there's 17.9MB of memory built-in – should keep you going for a few shots at least. Those who want to try a bit of filmmaking will be pleased to know there's a YouTube capture mode that films 640 x 480 footage at 30fps, for up to 10 minutes per film. Although the EX-Z150 has not had UK pricing and availability announced as of yet – it should be available in the coming months – when it does appear it will be available in silver, black red, pink, and green.